If you’re looking for multicolor smart LED bulbs and you’re not already deeply invested in the Philips Hue ecosystem, we’ve got a fantastic alternative for you to check out. It’s called the MagicLight WiFi Smart Light Bulb, and it’s just like Philips Hue’s $50 A19 bulbs. 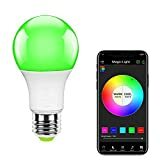 You can control them from the app or using a voice assistant like Alexa or Google Assistant, but they only cost $17.95 a bulb. That means you can buy almost three MagicLight bulbs for the price of one Philips Hue bulb!